Find the circumference using the formula. What is the circumference of a circle with a radius of 1 cm? What is the circumference of a circle that has a radius of 10 in? Compare to the perimeter of a regular polygon inscribed in a circle. In an earlier section, we found the perimeter of a regular polygon. We will use the perimeter of a regular polygon to estimate the circumference of a circle. On your paper, find the circumference of a circle that has a radius of 6 cm. Label this value, ACTUAL CIRCUMFERENCE. Use the slider to change the number of sides in the inscribed polygon. Start with 3 sides, then 4 sides, then 5 sides etc. Compare the perimeter of the n-gon to the circumference of the circle. 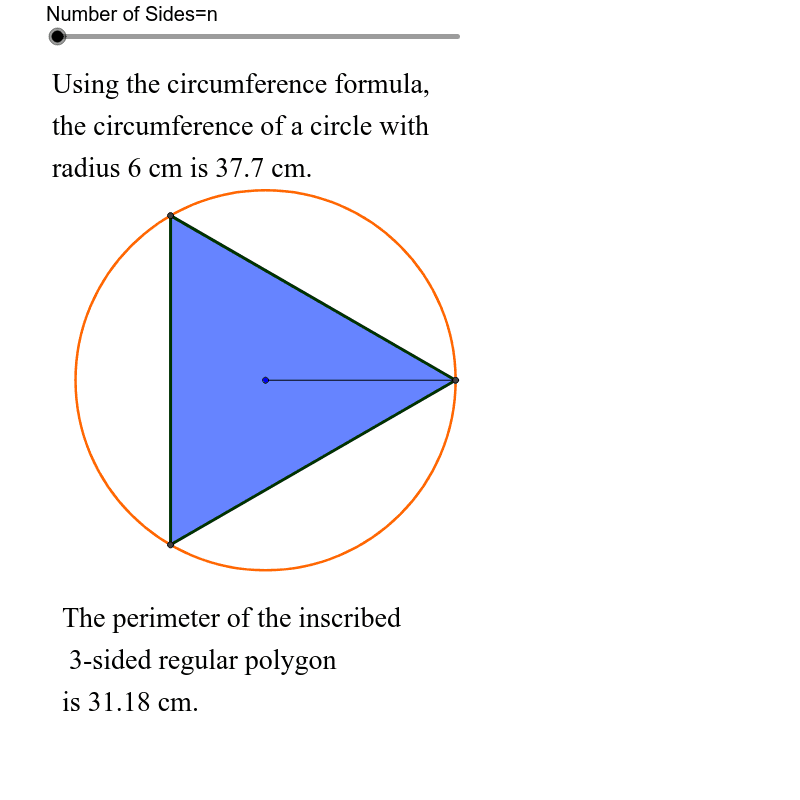 Move the slider and compare the actual circumference to the perimeter of the polygon. Explain what happens as you increase the number of sides on the polygon. Do you think that the perimeter of the inscribed regular n-gon is a good estimate for the circumference of the circle? Why or why not?